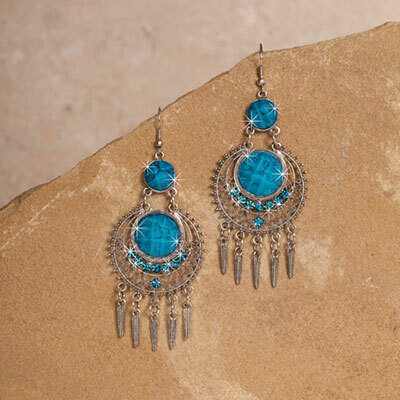 Add style to any outfit with these Santa Fe Earrings! Openwork pewter-tone frame with faux turquoise centers and brilliant blue crystal accents. Metallic feathers dangle from the base for added charm. French wires. 3¾ "l.
These earrings are pretty much as shown. They're large enough to make a statement but not too big. Only drawback for me is they aren't nickle free so I can't wear them but for a few hours.